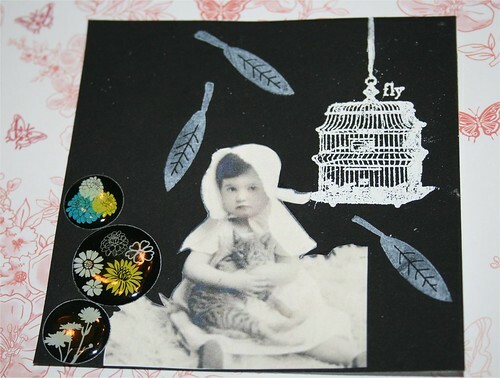 Fly Away Collage Card, originally uploaded by DianthusMoon. I need your vote please-do you think I am missing an element here? Perhaps a canary or another bird? It’s one of those cards I’m not quite sure looks finished. Not much news-surveyed the yard and cringing at what hasn’t been cleaned up and usually is by now. Update-thanks for your suggestions about a birdie on this card. I’ll have to look for one. My Mariner is in the shop again. We dropped it off today (the 19th) and the a/c compressor needs replacing. We are thinking the people who traded it in knew this already and that’s why they came all the way from a part in PA that’s over 2 hours away. The warranty should be in affect. We have a Subaru Forester as a loaner car. Bri insisted that I drive it and it was in manual shift and I didn’t know how to get it in drive. I had to drive it 10 miles shifting it! Geez. (another update-I didn’t have it in ‘D’, but below that-couldn’t figure it out when I was actually driving it). It’s a carbon copy of the Mariner and Escape. By the time I got home I amost had a migraine. We had gone out to eat near where we bought the car and I found an antique mall loaded to the gills. I’ve got to go there again! Hi Dianne:-) Just caught up on your latest posts I missed while I was away…first of all, Happy Anniversary to you and Brian!! I think a canary would be perfect. Are you thinking top left corner? great collage! and yes…a little birdie would complete it! sorry about the mariner – what a bummer!